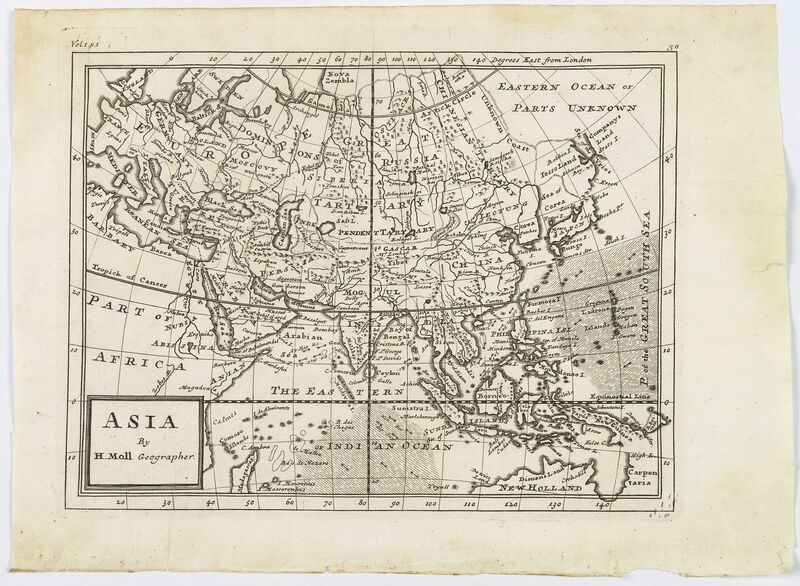 Old map by MOLL - Asia By H.Moll Geographer. Title: Asia By H.Moll Geographer. Size: 11.7 x 10.4 inches. Condition: In good condition, although paper is limp. Signs of some water staining, and with a few paper tears to the margins. Dark impression. Detailed map of Asia. From his "Atlas minor: or a new and curious set of sixty-two maps. . .", which was first published in 1729 and reprinted in 1732, 1736. The map is of interest for the use of Sea of Corea, the sea between Korea and Japan. Map has grid lines, degrees of longitude and latitude, trade wind direction, small box title. Over the course of his career, Moll published dozens of geographies, atlases, and histories, not to mention numerous sheet maps. His most famous works are "Atlas Geographus", a monthly magazine that ran from 1708 to 1717, and" The World Described" (1715-54). He also frequently made maps for books, including those of Dampier’s publications and Swift’s 'Gulliver’s Travels'. Moll died in 1732. It is likely that his plates passed to another contemporary, Thomas Bowles, after this death.